Illustrations note IX, 369 p.
Understanding the behaviour of unsaturated soils is becoming exclusively essential for geotechnical engineers and designers. This book includes the Proceedings of the International Conference ISSMGE uniting researchers and practitioners in geotechnical engineering on a single platform and discussing the problems associated with unsaturated soils. The objectives of the International Conference were: (a) to promote unsaturated soil mechanics for practical application, (b) to exchange experiences in experimental unsaturated soil mechanics and numerical modelling, (c) to discuss application of unsaturated soil mechanics to a variety of problems. 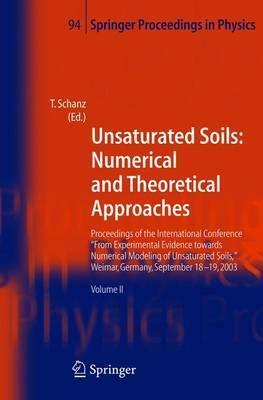 The conference was additionally a status report in the frame of the DFG research group "Mechanics of Unsaturated Soils." The conference was organised under the auspices of the International Society of Soil Mechanics and Geotechnical Engineering (ISSMGE), the National German Geotechnical Society (DGGT) and funded by the German Research Fund (DFG). Theoretical Approaches.- Conservation laws for three-phase partially saturated granular media.- Thermally-induced pore pressure generation in a nearly-saturated cementitious material.- Strain localisation simulation in non-isothermal multiphase geomaterials.- Non-linear behaviour in the deformation and localization analysis of unsaturated soil.- A process-oriented approach to compute THM problems in porous media - Part 1: Theoretical and informatics background.- The influence of hydraulic hysteresis on unsaturated soils FE analyses.- Effects of intergranular adhesive force on failure criterion of granular materials.- A bounding surface plasticity model for sands in an unsaturated state.- A unified framework for elastoplasticity of unsaturated soils: From capillary hysteresis to soil skeletal deformations.- State parameters for unsaturated soils, basic empirical concepts.- Investigations regarding soils below phreatic surface as unsaturated porous media.- Inspection of excess pressure propagation in the zone of gas entrapment below the capillary fringe.- A new concept for the numerical simulation and parameter identification of multiphase flow and transport processes in cohesive soils.- Statistical approach in soil-water characteristic curve modelling.- Generalized effective stress in unsaturated granulate by DEM analysis.- Grading entropy variation due to soil crushing.- Numerical Modelling.- A process-oriented approach to compute THM problems in porous media - Part 2: Numerical applications.- Numerical study to the desiccation cracks formation in mineral liners for landfills.- Modelling the behaviour of an earth and rockfill dam during construction and impoundment.- Numerical simulation of air loss during tunnel advance in compressed air tunnelling.- Centrifuge and numerical modeling of contaminant transport through the unsaturated silty soil.- Modeling of seepage flow through layered soils.- Hydro-mechanical behaviour of unsaturated buffer.- Applications of CODE-BRIGHT to thermal-hydro-mechanical experiments on clays.- An unsaturated soil seepage analysis for design of a soil cover system to reduce oxidation of a mine tailings deposit.